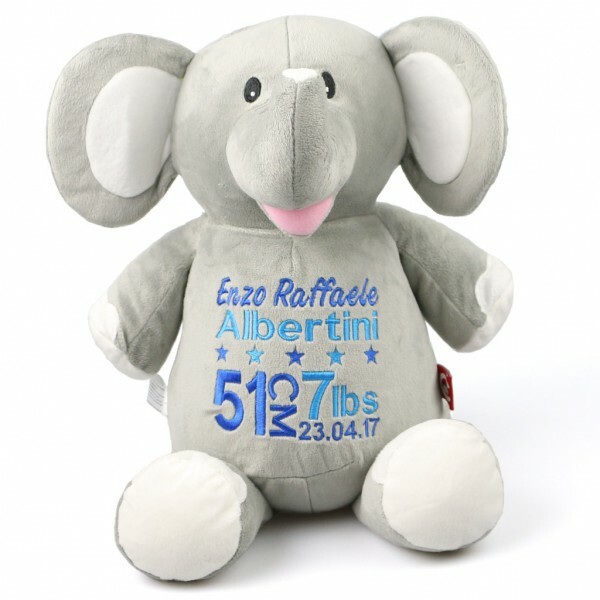 If you’re looking for a unique and memorable gift, you can’t go past our adorable personalised plush elephant. His soft, velvety fur makes him perfect for cuddles and he has a large tummy area ready to be embroidered with one of our many designs. He is always a hit as a first birthday or Christening present complete with a heartfelt message, or for a newborn gift we have some lovely birth details designs to choose from. Best of all, his removable pods make him easy to hand wash so he’ll stay looking fresh for all of the years he’s loved by his new best friend. If you have any questions about our Personalised Plush Elephant, don’t hesitate to get in touch.